To start, it's important to understand that consumer electronics are some of the most energy intensive and complicated objects we know how to manufacture. For example, according to product lifecycle data compiled on Sourcemap.org, producing a kilogram of laptop consumes an order of magnitude more energy than a kilogram of aluminum. In other words a 2 kilogram laptop takes 10 times more energy to make than a 2 kilogram aluminum chair. The same laptop took 100 times as much energy to make as a 2 kilogram wooden chair. And yet, we might use a laptop for only 3 years, while we would keep a chair for maybe 30. Some antique chairs are hundreds of years old! Electronics recycling does a good job keeping heavy metals like lead and cadmium out of landfills - in 2006 in the US, over 70% of the heavy metals in landfills came from electronic waste, but only 2% of landfill waste was electronics . But the energy embodied in electronics comes mostly from refining and processing the component parts into complex assemblies. So every time electronics get recycled, it costs another helping of energy. That energy, in almost every case, comes from fossil fuels, and causes all the bad problems that we associate with them. So, rather than throwing away the order that we have spent so much energy to impose on the matter in electronic devices, it would be better if we could somehow disintegrate and re-integrate these devices into new devices, with new, more useful functions. After all, in most cases, electronics are discarded because they are out of style, or outmoded for a particular task. Perhaps your phone won't receive pictures, or use polyphonic ring-tones. Maybe you want a touchscreen. In other cases, electronics can be "broken" when their mechanical parts like hinges or screws break, even though their electronic guts are still perfectly intact. Finally, sometimes something like a screen or battery will break, leaving the balance of electronic parts -- and all the value embodied in them -- still working. In any case, disposing of these electronics represents a disposal of value, and a loss of embodied complexity -- and energy. The SSG Framework allows a product in each of these situations to keep as much of its embodied information as possible. SSG stands for Skin-Skeleton-Guts, and describes the functional separation that occurs between different components of a product. The main functionality of SSG devices is provided by the guts. These guts might contain electronic modules, motors, sensors, screens, or batteries. Each functional aspect of the device - the power, processing, and display, for example - are separated into interchangeable, reprogrammable modules. 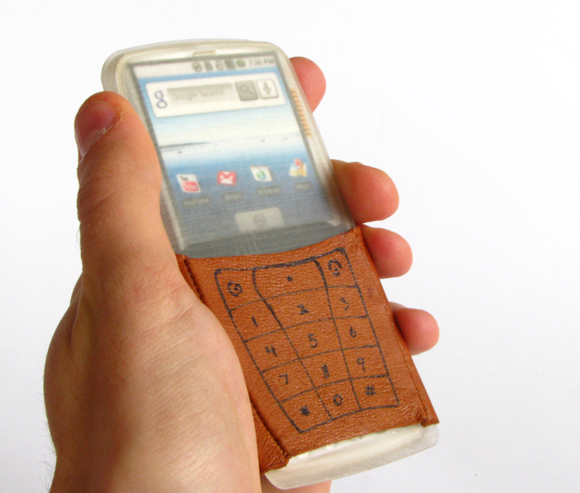 The image above shows a cellphone prototype mock-up built around the SSG framework. This phone has a number of modular "blades" of electronics, each of which has functional components (a power converter circuit for the battery module, for example), as well as re-programmable control components. This reprogrammability allows the modules to be re-arranged with respect to each other, and to have new functionality loaded onto them via software. Because these modules can be rearranged, recombined and reprogrammed to create different functional collections, the same guts modules could be re-used in multiple designs - a cellphone and e-reader, for example. The diagram below shows how many of the same guts may be rolled over into a new design for an E-reader. 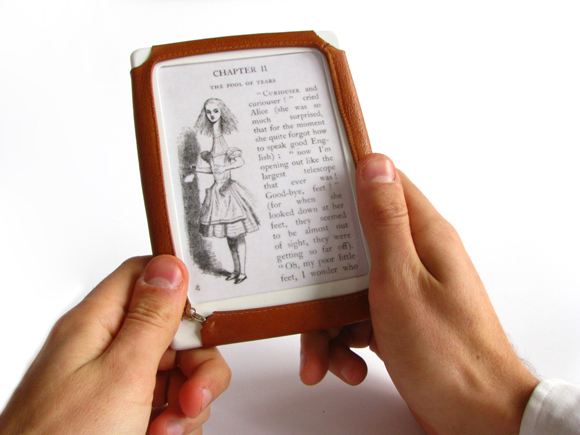 In this case, a new e-ink screen, and larger battery are the only new hardware needed. The remaining functional differences are taken care of by firmware and software alterations to the existing modules. The guts function on their own, but their fragility, and their awkward shape requires protection and form. Like the bones in your body, a skeleton of simple, interlocking parts protects and gives form to the guts. This skeleton might be made from 3d printed plastic, or it might be carved from wood, depending on what local materials and machinery are available. Bones of the skeleton are intentionally designed to be simple to make, and don't require screws or glue, since these can be difficult to find in all markets, and can break. Rather than using glues or screws to hold the skeleton together, a sewn skin is used. This skin can be made from synthetic material, natural fabric, or leather, in an almost infinite variety of colors and textures. Sewing machines are one of the most ubiquitously available machines around the world, so the skin, which wears out the soonest, can be repaired most easily locally. And, for customers who desire frequent changes of their product styling, the skin can be swapped easily and cheaply, without wasting large amounts of energy. Building devices in this way maximizes the capacity for remixing, because of the ease of editing each component. Everyone has access to a sewing machine, or needle and thread, or knows someone who does, so everyone can edit a skin. Many people know how to edit 3d models, 3d printers are getting cheaper, and websites like Ponoko and Shapeways allow send-away 3d printing, so many people can design and make skeletons. Not very many people are skilled enough to design entirely new guts modules, but lots of people can program, and anyone with a computer can rearrange modules according to an Instructable or other instruction set, and upload new guts software which they downloaded online. By allowing the maximum amount of people to edit an SSG design at every level, the likelihood of local production of custom instances of products goes way up. In addition to having exciting possibilities for eco-friendly and value-conscious design, SSG makes all kinds of new things possible in the realm of open hardware. The Humblefactory is just beginning to explore the boundaries of this new space -- look for an upcoming post about the ramifications for competition of open hardware in the global marketplace. But until then, the first true SSG product (only a single guts module, but SSG nonetheless) is out in the wild. 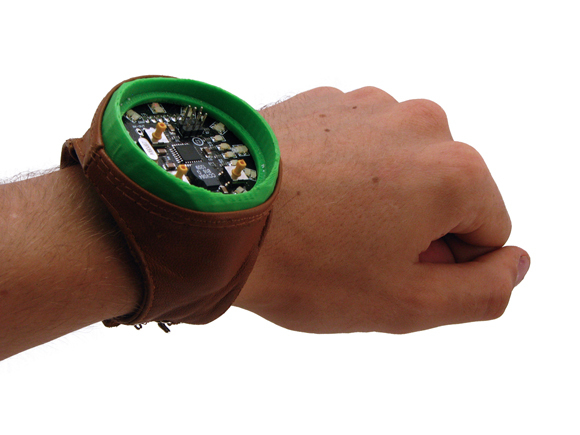 Based on Bre Pettis's Makerbot Watch as a guts module, this watch is fully open: software, circuit, skeleton, and skin. You can experiment, if you like, at Thingiverse, where the files are hosted. A Making-of video is in the works, but for now, take a look at some finished product shots. The Skeleton is in two parts, and is currently only printable with support material, although a makerbot-printable version is theoretically possible, and will hopefully emerge soon. You can see how the different bits come together here, and how easy it would be for someone to alter one without having to worry about the others. Dominic Muren on why electronics recycling is stupid from Karen Eng on Vimeo. Excellent post Dom! TED was lucky to have you there - see you at the Open Hardware Summit in NYC! I was also thinking about desiging modular electronics to minimize waste and costs long-term but I've got a concern: This philosophy is in contrast with compactness which is a strong requirement nowadays. How are we supposed to solve this problem? Good point - An SSG product will almost necessarily (at least for the foreseeable future) be bulkier than a comparable monolithic product. However, there seems to be a lower bound to the usefulness of compactness - consider the similarity in size of the MotoRazr phone and iPhone, even thought one is much more powerful. I submit that given enough time to develop compact connectors and to optimize the standards / modules which might contribute to such an ecosystem, SSG devices could be comparably compact to monolithic devices, though they might have to sacrifice power for thermal optimization reasons. In the case of these slightly underpowered SSG devices, I suspect that they would make up for their deficit by having more specifically tailored functionality. By focusing on a few functions at a time, rather than all possible functions, as an iPhone does, such devices might be just as functional, despite their lower power. In any case, it is a valid concern. I would welcome any suggestions you might have for addressing, or overcoming this shortfall. Making modular electronics mainstream is a fascinating concept. I can imagine buying my next watch, phone, or camera on ETSY, because that is where the leading edge designers sell their creations - I could even start to consider getting 'custom' electronics built for me, or If I was brave- try my own hand at it. Sweet. To help make this happen faster, I would imagine a 'student design challenge' that uses the SSG framework might create a flood of designs and help kindle the concept. Let's chat about how I can help make that a reality.